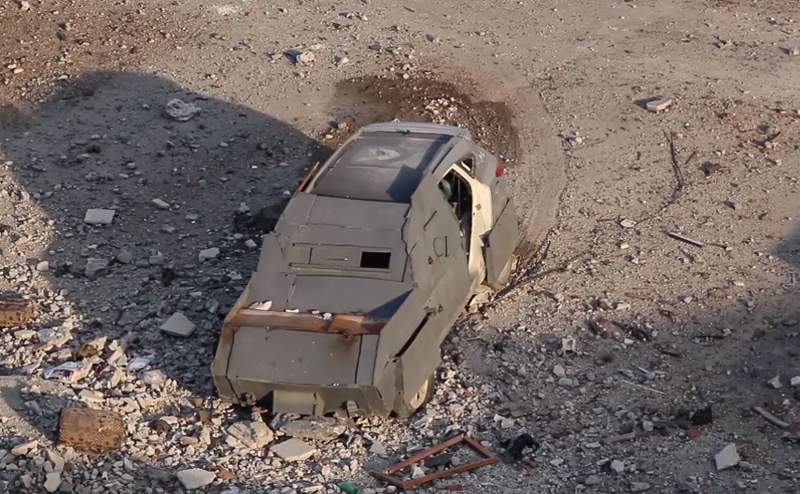 This is the first part of a series of articles covering the IS development and innovation of SVBIEDs from the battle of Mosul to the current situation. 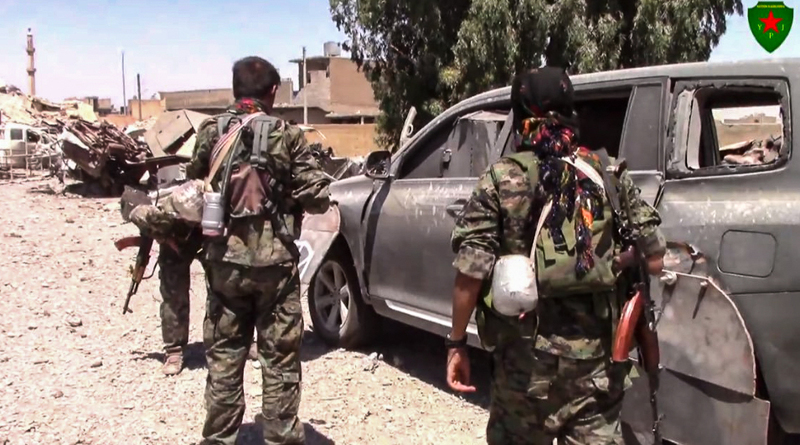 The first part will cover the battle of Raqqah, while the second part will cover the battle of Deir ez-Zor and the concurrent loyalist and SDF offensives along the Euphrates. It’s easy to look at the Islamic State’s SVBIED output as uniform, but that is far from the case. 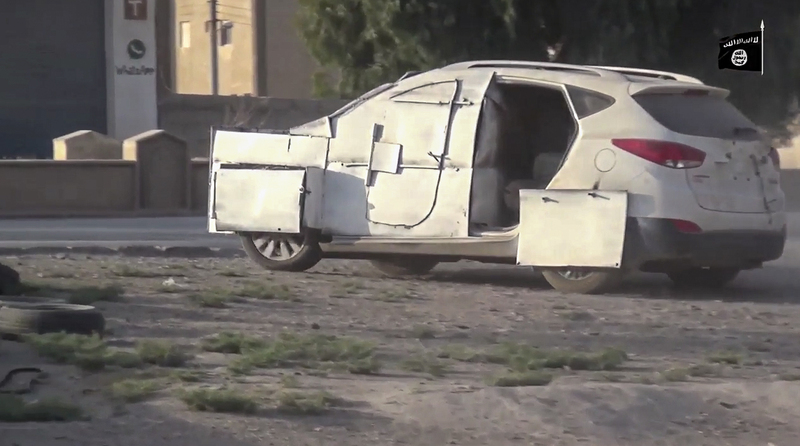 While there has been local SVBIED workshops in each of the Islamic State’s wilayaat (provinces) in Syria and Iraq, the ones in and around Mosul and Raqqah were always above average, both in quality and quantity. When looking at SVBIED production capabilities as a whole in the territories formerly under Islamic State control, the resource availability naturally gravitated toward larger urban centres: Namely Mosul and Raqqah. 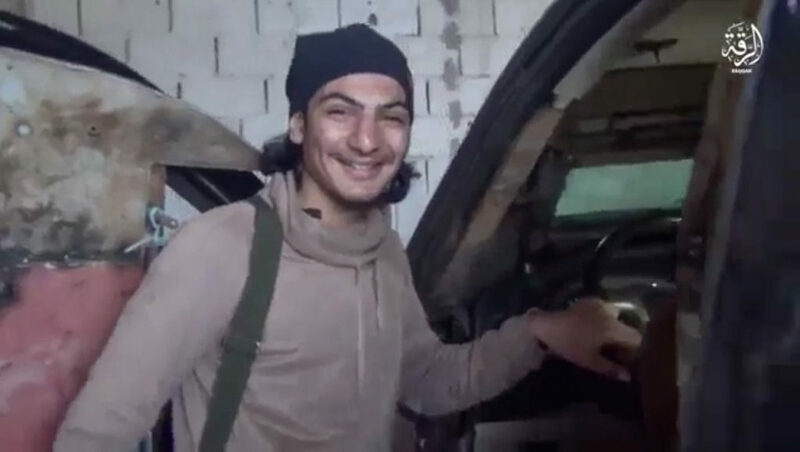 The infrastructure and resources that came with capturing these cities allowed the Islamic State to manufacture especially well-made SVBIEDs there, in addition to resulting in more standardized SVBIED designs and the capability to supplement SVBIED operations in surrounding IS provinces. 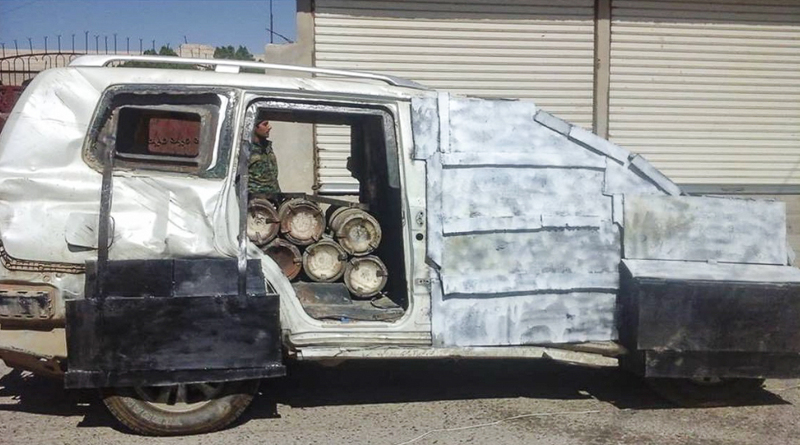 During the battle of Mosul (Oct. 2016 – July 2017), SVBIEDs manufactured by IS were geared towards the threats faced in such a vast urban environment. 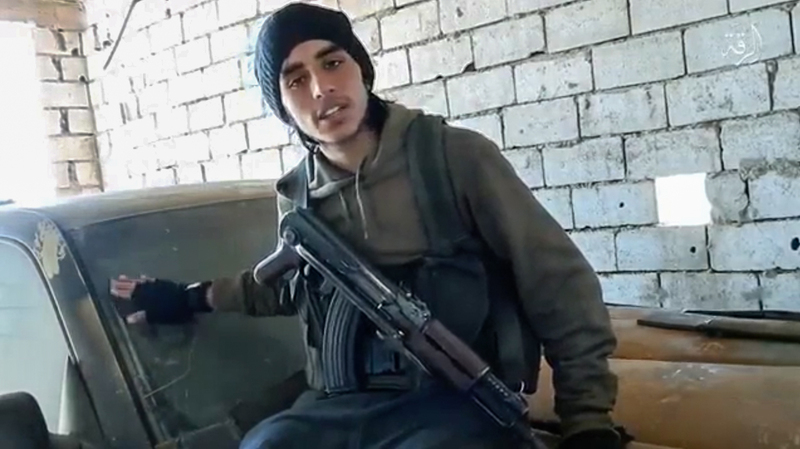 It resulted in a new type of SVBIED, a mix of the best qualities offered by both covert and up-armored SVBIEDs. 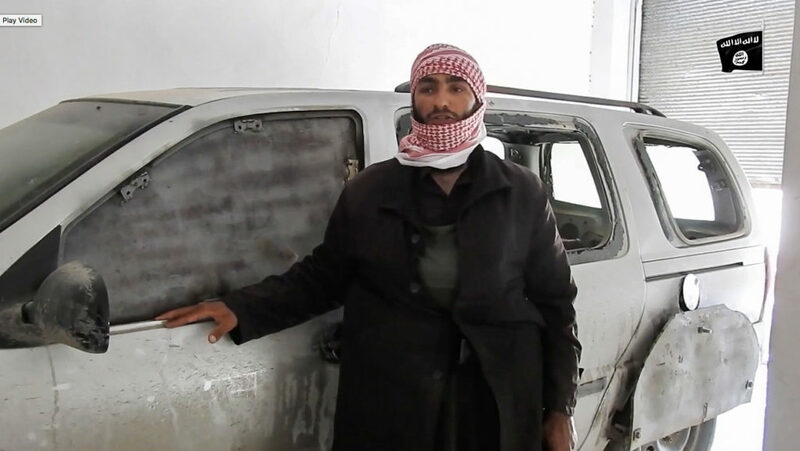 ‘Camouflaged’ SVBIEDs were an attempt at making the SVBIEDs appear as civilian vehicles, while still offering the same defensive properties of up-armored SVBIEDs. 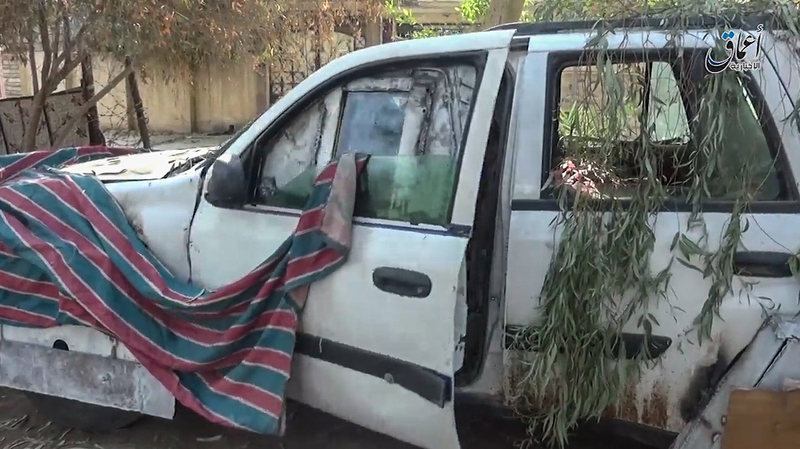 In E. Mosul, IS primarily deployed “stage 1” camouflaged SVBIEDs, which included the armor being painted in the same color as the vehicle the SVBIED was based on. 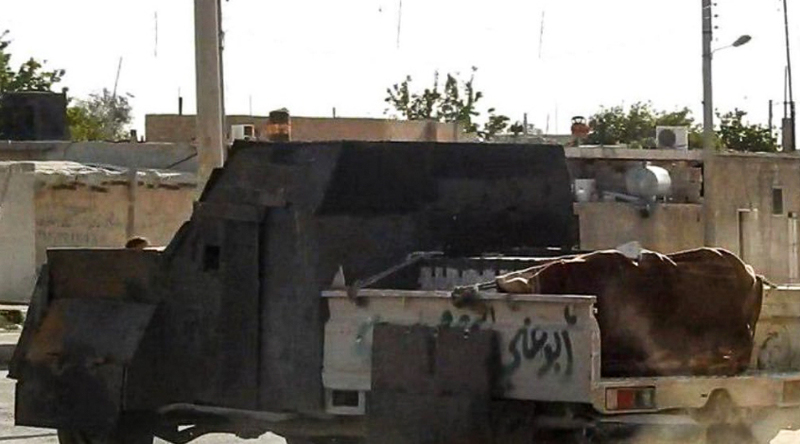 As the battle progressed to W. Mosul, “stage 2” camouflaged SVBIEDs were introduced. 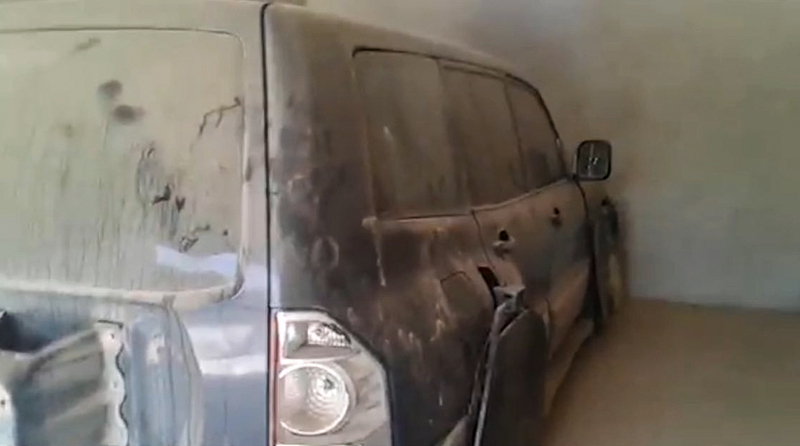 These featured fake vehicle features (incl. 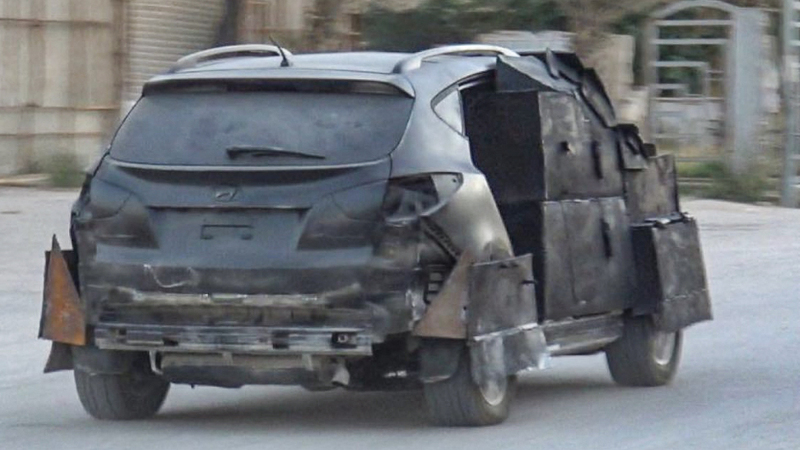 wheels, windows, grilles) painted in black on top of the armor already painted in the same color as the vehicle the SVBIEDs were based on. These designs came about as a result of the increased military pressure felt by the group, caused by air strikes and concurrent loss of territory. 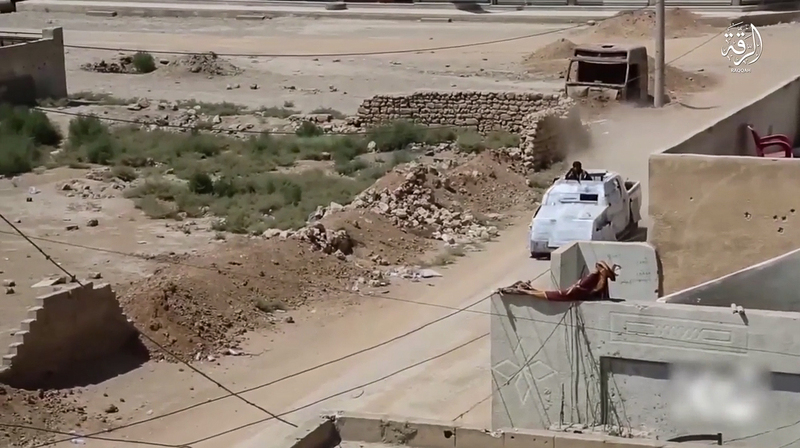 Camouflaged SVBIEDs were meant to confuse enemy air support, as well as enemy forces on the ground and make them believe (if only for a few seconds) that the vehicle racing toward them was not an SVBIED. This may seem like a futile attempt, but in a massive and sprawling urban center like Mosul, a few seconds could be the difference between life and death for the advancing Iraqi Army. 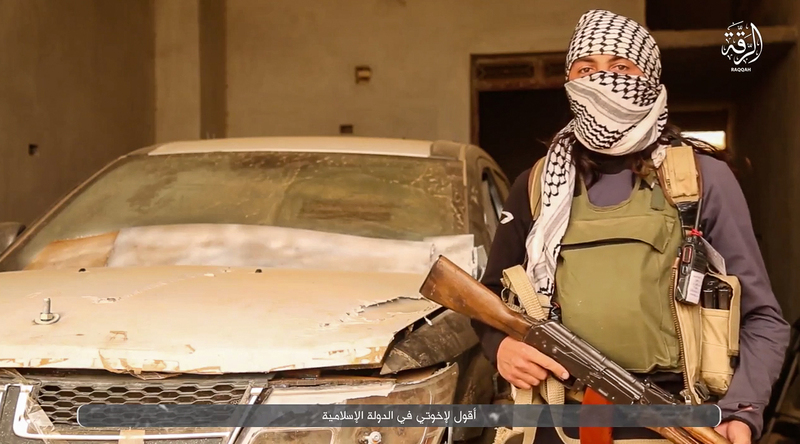 As the fighting was raging in E. Mosul, there was a single SVBIED featured in an Amaq video released on November 8th, 2016. 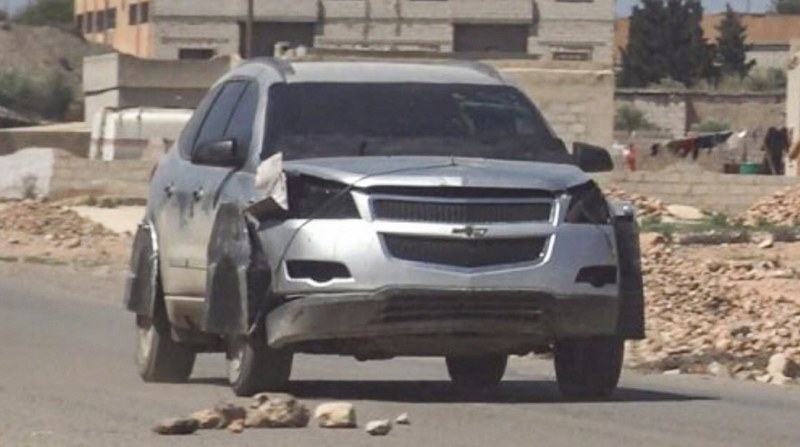 It looked unlike any other SVBIED documented during the battle of Mosul. 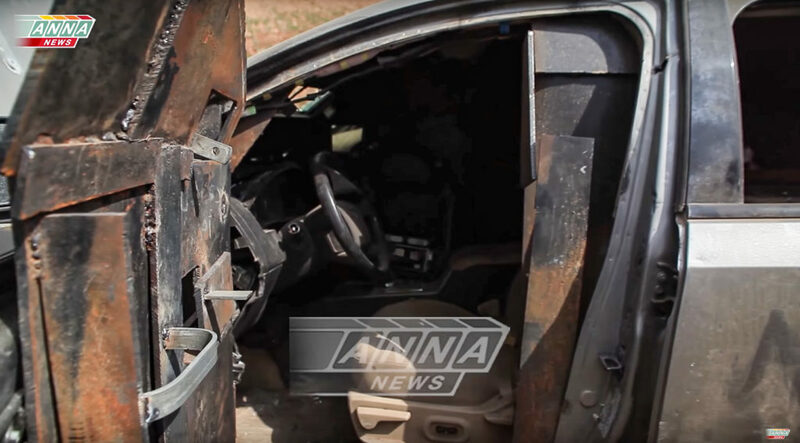 The armor had been mounted on the interior of the vehicle instead of on the exterior. 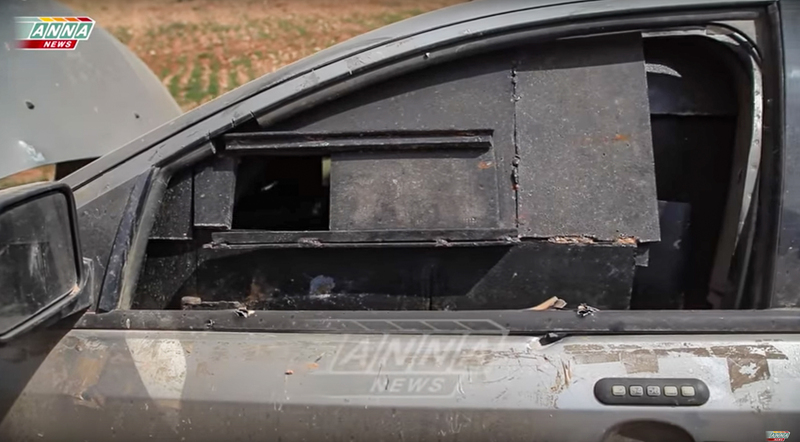 As Syrian loyalists were advancing in the Eastern Aleppo countryside near Deir Hafer in late March, 2017, they managed to disable an interesting SVBIED. 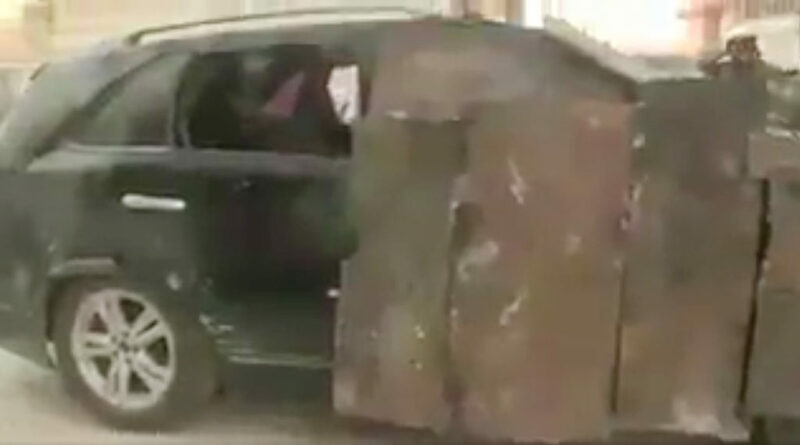 It turned out to be another “stage 3” camouflaged SVBIED, but it showed remarkable improvements and refinements in comparison to the first example recorded in Mosul in November 2016. 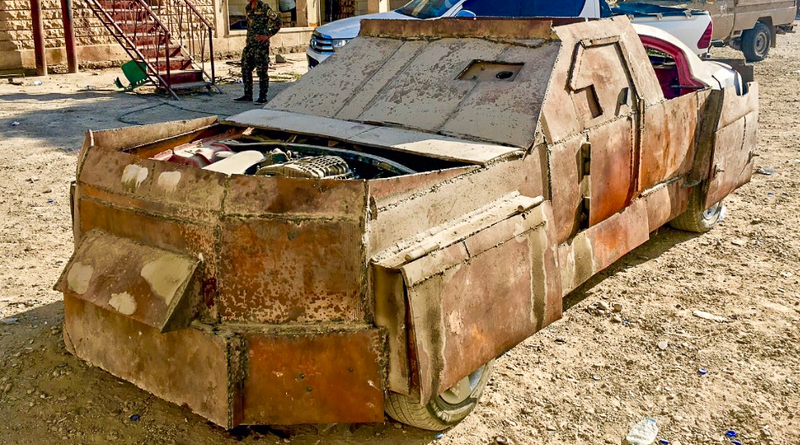 This time, all of the improvised armor was mounted on the interior. 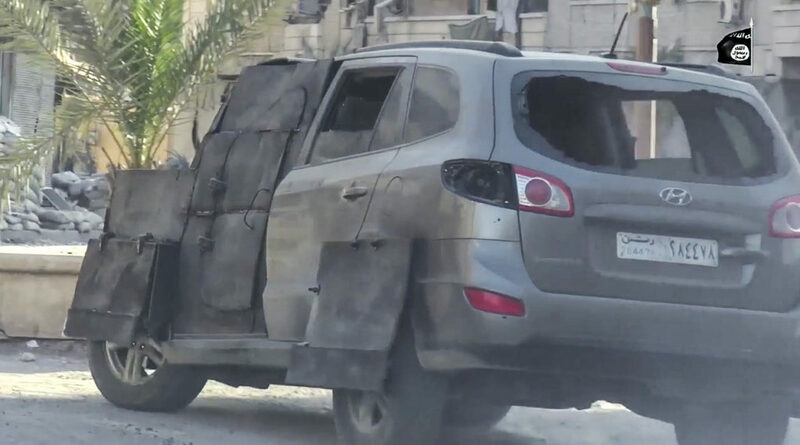 The wheel armor, interior side door armor, and likely also the interior windshield armor was painted black to blend in with and look like the standard features on the vehicle. A metal plate was also placed under the hood in front of the engine block. 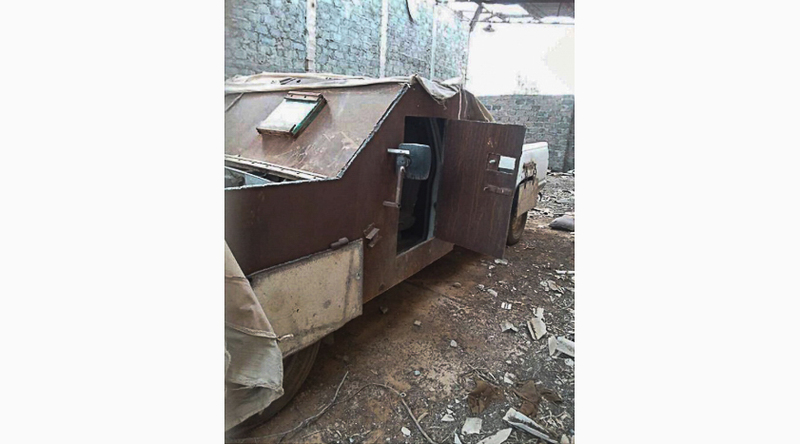 A similar example was shown in an IS photo report from Dar al-Fateh in the E. Aleppo countryside on April 4, 2017. 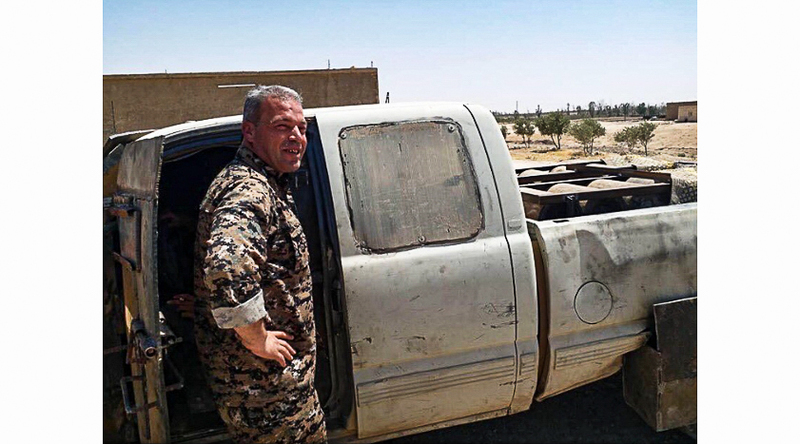 Two days later, as the Kurdish-led Syrian Democratic Forces (SDF) were battling IS East of Tabqah city, situated just Southwest of Raqqah across the Euphrates, yet another “stage 3” camouflaged SVBIED appeared. 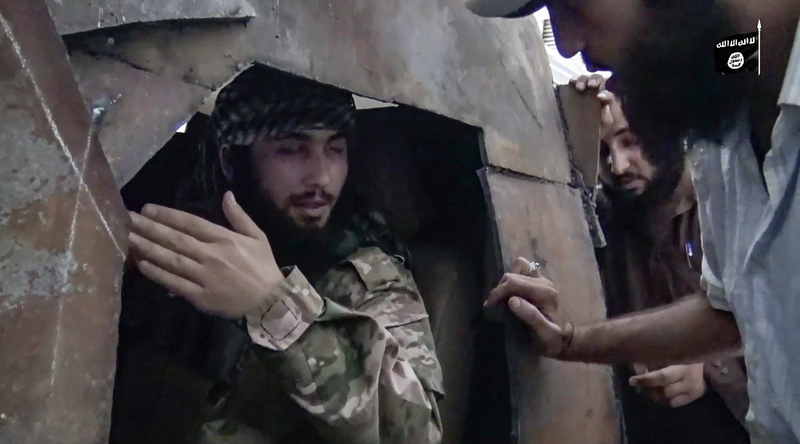 At a first glance, the armour kit mounted on this SVBIED looks almost identical to the one captured by Syrian loyalists in Aleppo in March. On closer inspection, though, there seems to be one exception. 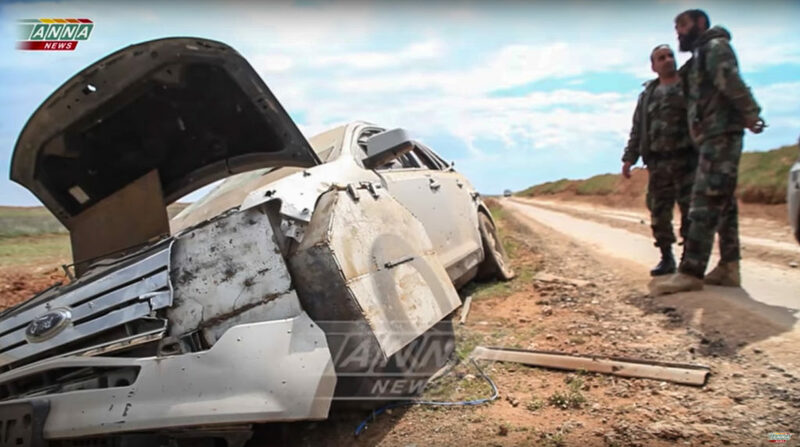 Instead of inserting a metal sheet under the hood, IS removed the entire front of the vehicle’s exterior. Metal plates covering the entire engine block and other vital systems were attached, before the removed section was re-attached over the plates. 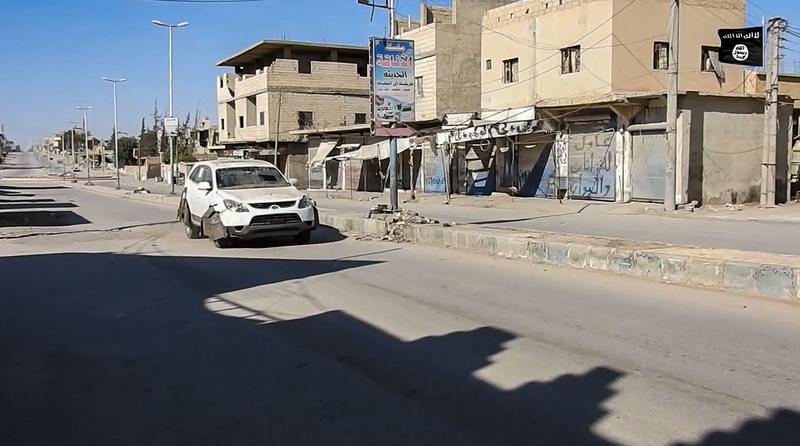 I was able to document 35 individual SVBIEDs via video footage and photos that were used in and around Raqqah since early April, 2017 up until SDF completely recaptured the city in mid-October. 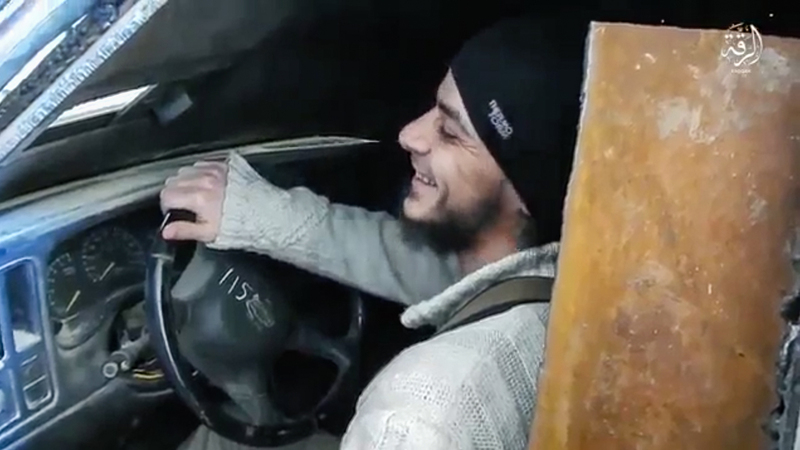 Out of those 35 SVBIEDs, at least 26 were some type of camouflaged SVBIED. 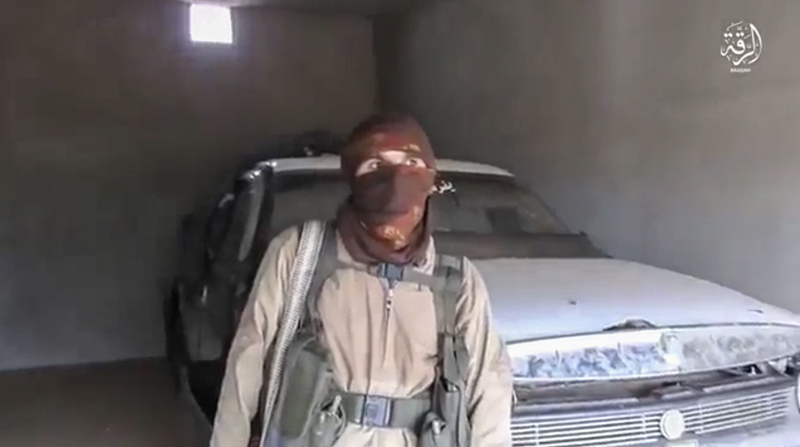 “Stage 3” camouflaged SVBIEDs stood out the most, accounting for a dozen (more than a third) of the recorded examples. 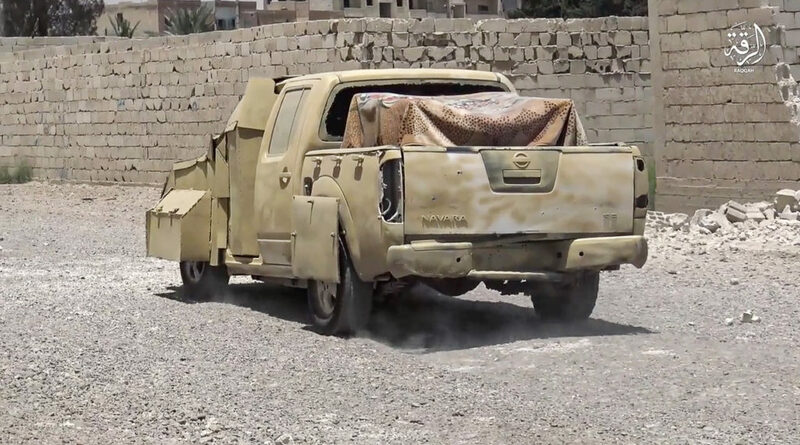 It would seem that the IS contingent in the Raqqah area continued where IS in Mosul left off, further innovating within the camouflaged SVBIED designs. The below composite image shows just how big of a difference there is between “stage 2” and “stage 3” camouflaged SVBIEDs. Opting for interior instead of exterior armor dramatically increases the ‘covert’ factor of the vehicle. 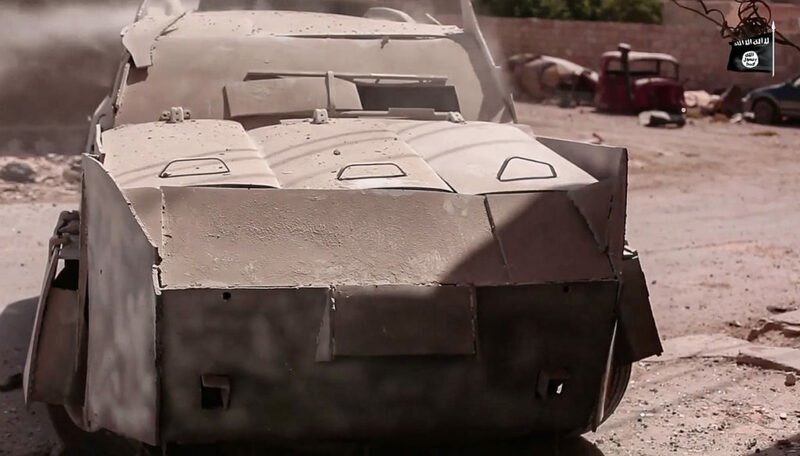 It’s also worth thinking about the terrorism aspect/potential of these SVBIED designs. 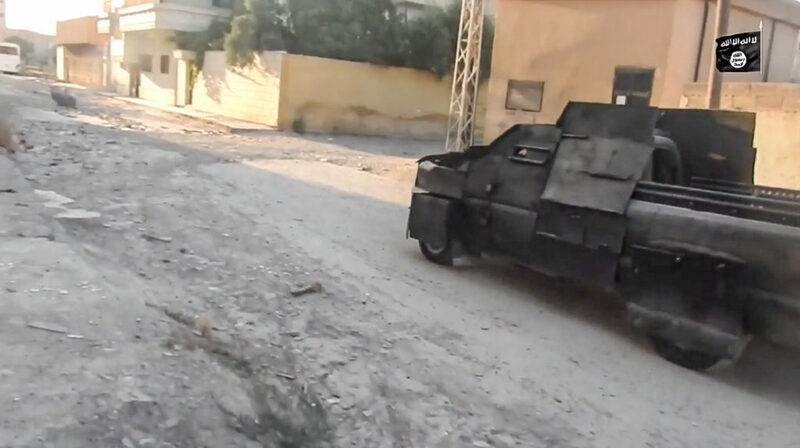 Camouflaged SVBIEDs (especially “stage 3”) would be extremely difficult to counter if such a vehicle was used in a terror attack outside the active battlefields of Syria and Iraq. Favoured targets would likely include military installations, well-guarded institutions/Gov. ministries, etc.. In the 12th issue of the English-language IS magazine “Rumiyah”, released on August 6, 2017, a clue was given about the Raqqah-Mosul connection regarding camouflaged SVBIEDs. In an interview with the (unnamed) IS military commander of Raqqah, he is asked about what effect the battle of Mosul has on the battle of Raqqah. He answers that “the brothers in Mosul employed new tactics[…]”, and that “the brothers’ experiences have been passed on to all the wilayat so they could benefit from them, both militarily and in terms of iman (faith)[…]”. 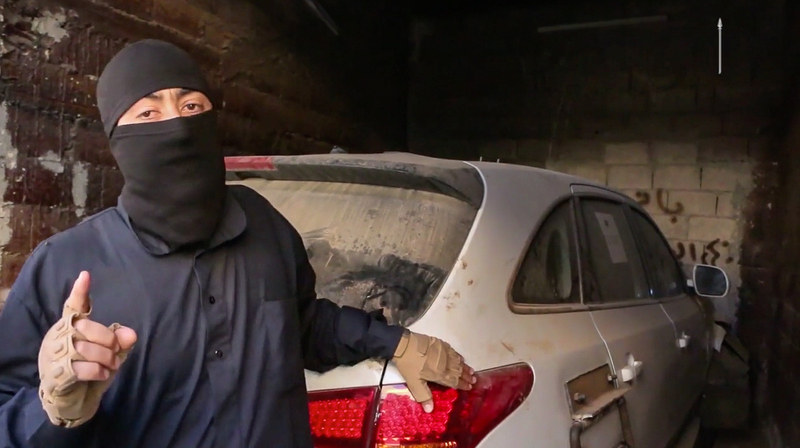 While he doesn’t specifically mention SVBIEDs, it’s highly likely that information about new SVBIED designs was shared by the IS contingent in Mosul with the one in Raqqah, especially since it’s their most important type of weapon. Considering that Raqqah was the only major city left under IS control after the recapture of Mosul city, it’s only natural that they would be the ones to continue innovating within camouflaged SVBIED designs, as they were the only province with enough resources to continue doing so on a larger scale. This speaks volumes about the level by which inter-province cooperation with regard to military innovations across IS former territories took place. The battle of Raqqah played out very similarly to the battle of Mosul, with IS employing identical operational procedures regarding the employment of SVBIED attacks. Just like in Mosul, pre-recorded UAV or satellite images were used to plan out attacks and guide SVBIED drivers to their targets. 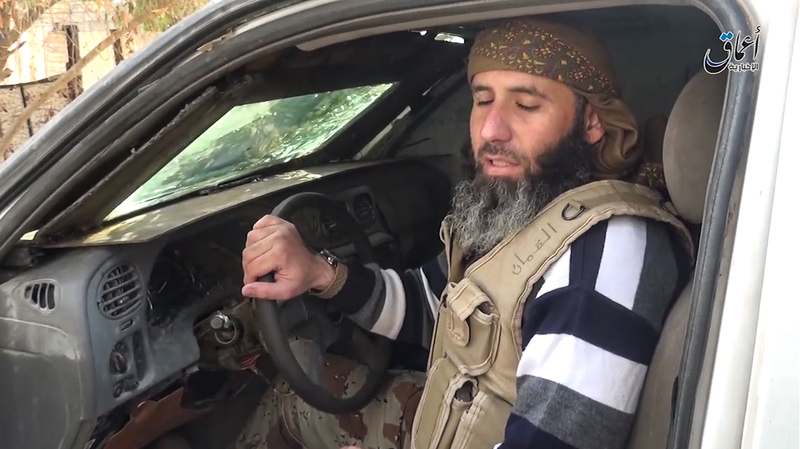 Similarly, local IS guides on motorcycles would guide in the often unfamiliar SVBIED drivers from the SVBIED forward hide sites to the frontline. Furthermore, the SVBIED drivers were also in direct radio contact with an SVBIED support team during the entire attack up until detonation. The support team followed the SVBIED with a commercial drone, allowing for on the spot target corrections or route changes. 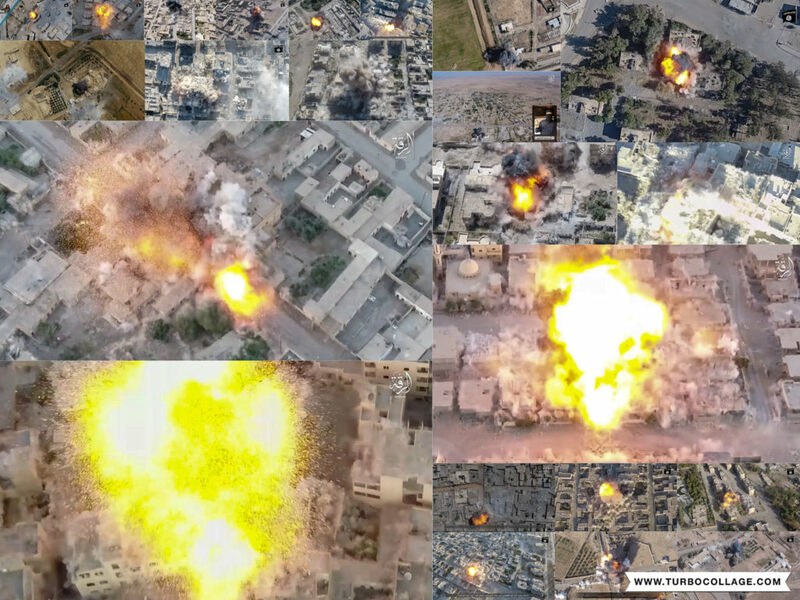 In video releases from Raqqah I documented at least 23 cases of successful SVBIED attacks on SDF positions recorded via IS drones. 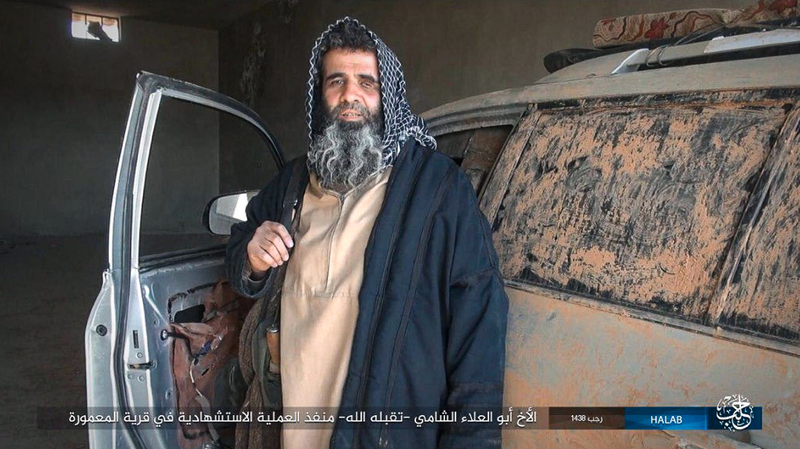 IS in Raqqah also made use of handicapped SVBIED drivers, a phenomenon also seen during the battle of Mosul. 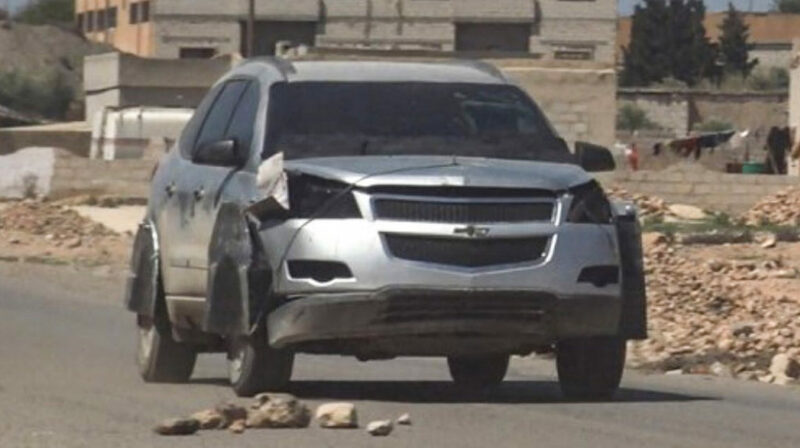 Looking at the SVBIED payloads, it seems the IS contingent in Raqqah also started using anti-tank mines mounted to the [front] and sides in an attempt to direct the explosive energy. 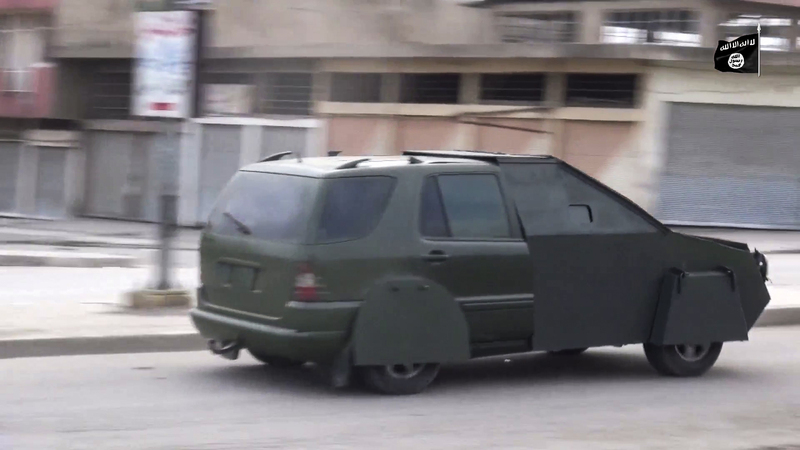 SVBIEDs are extremely adaptable weapons. 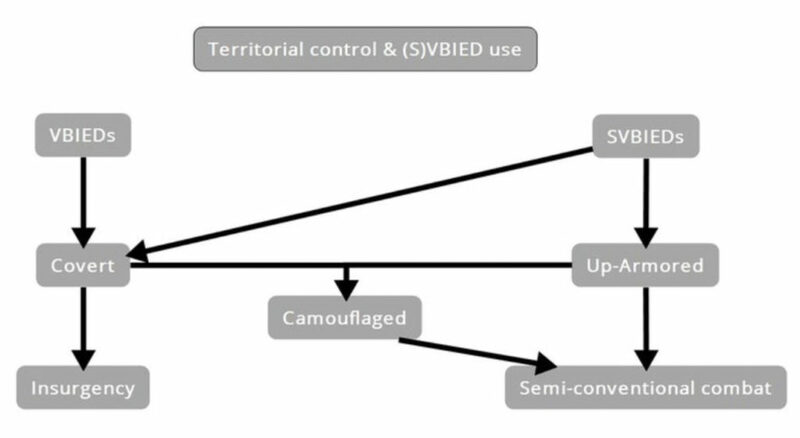 Basically all new designs and modifications to pre-existing types are the result of a reaction to either a changing battlefield situation or changing enemy tactics that could potentially negatively affect the success rate of pre-existing SVBIED designs. 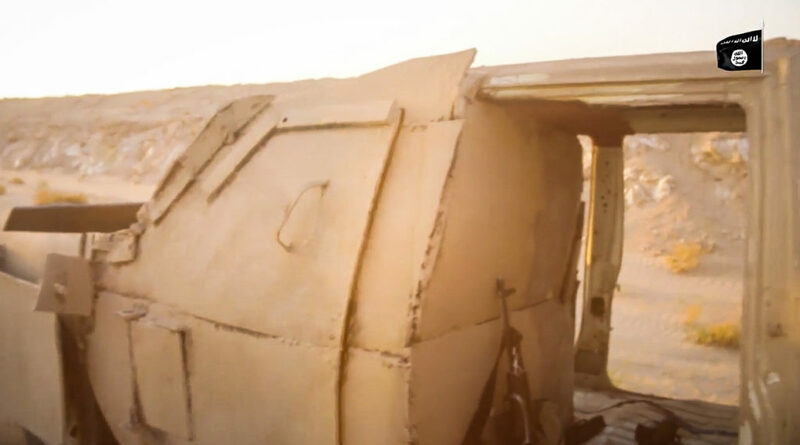 As the war has raged on in the past years, reactions have been met with counter-reactions, spurring further SVBIED design innovation. 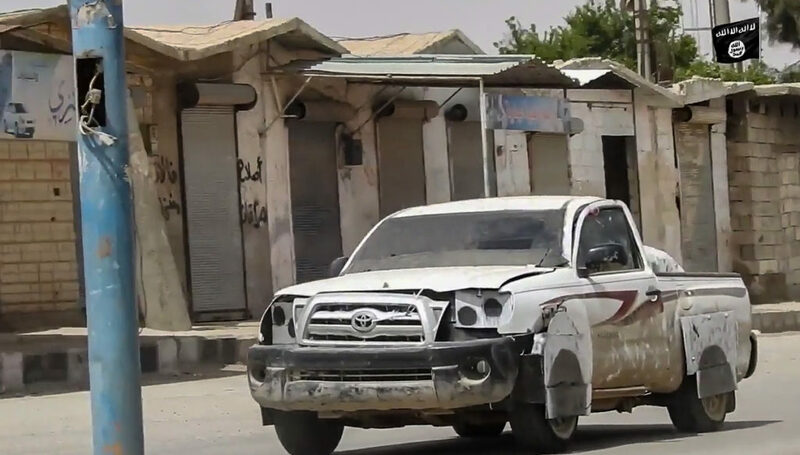 IS have continually attempted to stay one step ahead of its enemies’ counter-SVBIED tactics, and the thousands of SVBIEDs they’ve employed in battle in the past years has allowed them to gain a deep understanding of what to use when, where, and against what. 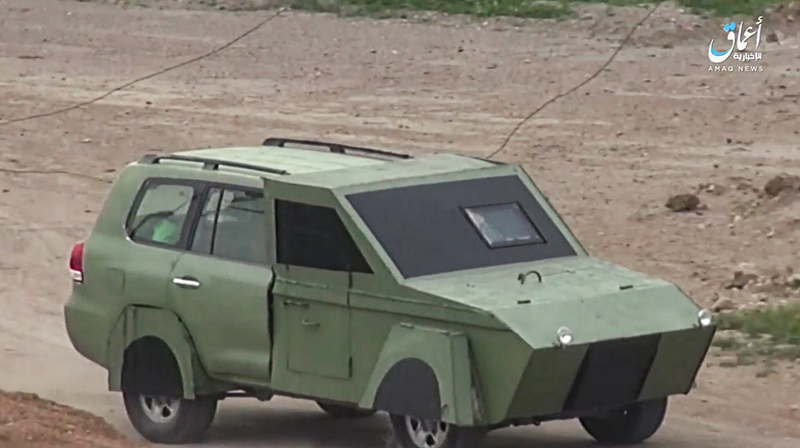 The most dangerous aspect of all this SVBIED field testing and the emergence of new SVBIED types is the precedent it’s setting for the future. 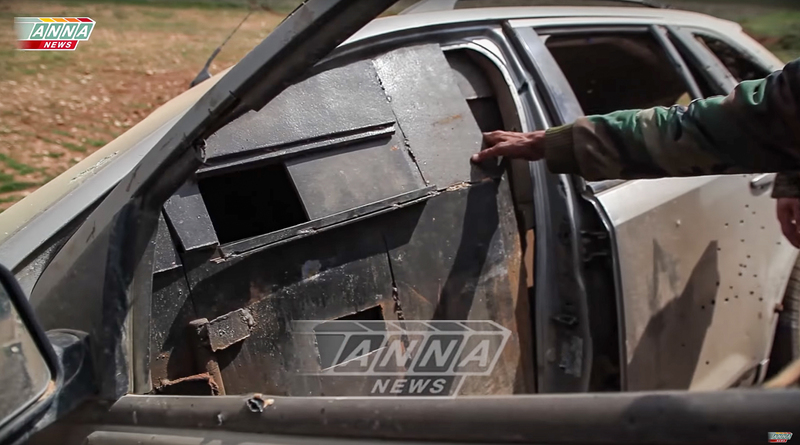 IS still have a territorial presence in Syria, but even when they’re gone they’ve still got the blueprints for all these different SVBIED designs. 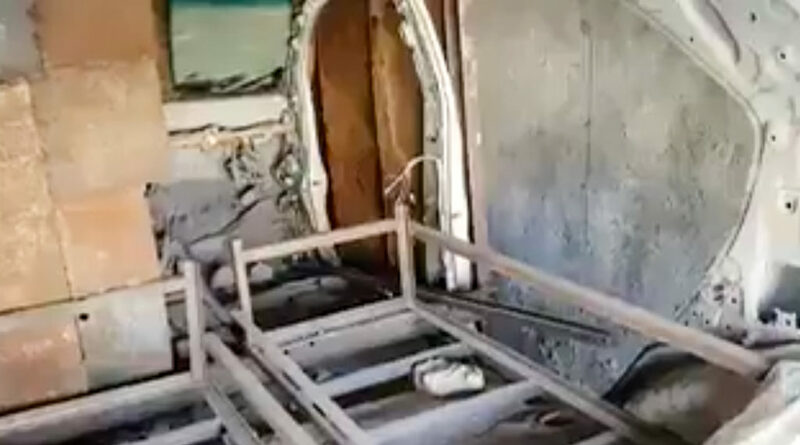 That’s what’s extraordinary about camouflaged SVBIEDs, the entire development, field-testing, and refinement process has been documented in Islamic State propaganda – from plain white up-armoured SVBIEDs (“stage 1”), to fake windows/wheels (“stage 2)”, and eventually interior armour (“stage 3”). But, this goes beyond IS. 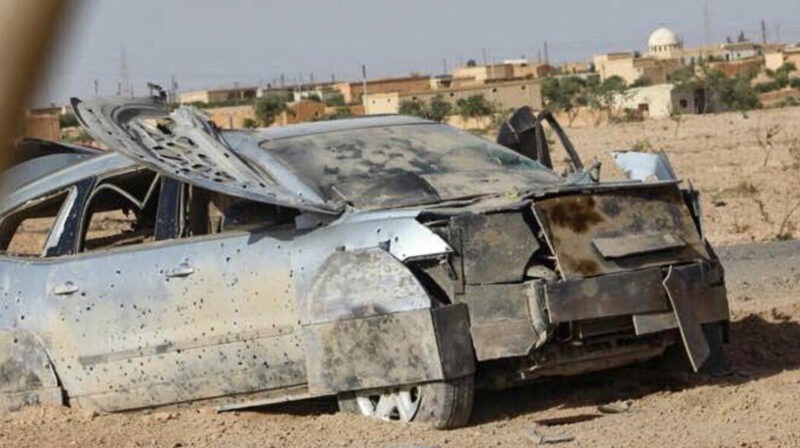 Any militant group in the future with enough resources and an ideology that allows for suicide bombings can take a quick look at what IS have used and simply pick up where they left off.